Raw video footage from the first day of the DN North American championship regatta sailed on Green Bay near Peshtigo, Wisconsin on Friday, January 27, 2017. Video shot by George Gerhardt. 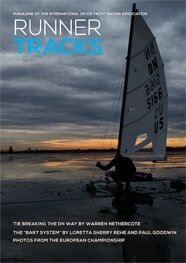 The DN is most popular iceboat in the world. Whether you are a racer or cruiser, your $25 membership in the IDNIYRA helps to promote the art and skill of DN ice yacht construction and the sport of ice yachting on all the hard waters of the world.